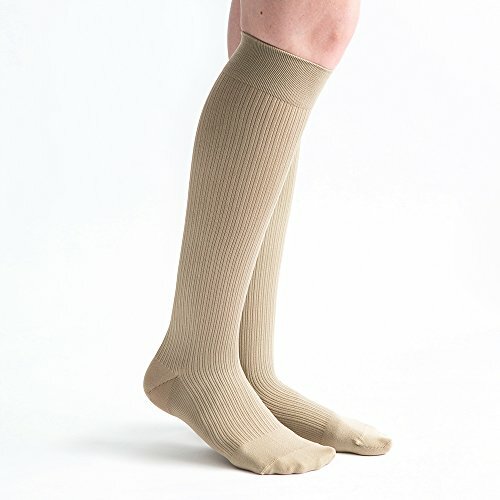 The VenActive Women's Ribbed Trouser firm 20-30 mmHg knee high graduated compression socks combine a classic ribbed pattern with modern-day microfiber technology allowing for easy application, a soft feel and advanced moisture wicking. The unique y-gore heel and toe provide a comfortable, anatomical fit reducing shifting and friction for all day wearing comfort and the extra-wide top band prevents pinching and binding. Available in black, navy or khaki. Sold per pair. Engineered for maximum comfort and durability with a fully incorporated gradient compression profile. The VenActive range features an anatomically shaped heel and non-irritating toe pocket allowing for a more natural and relaxed fit. Designed in the USA, VenActive provides a fashionable appearance with unmatched durability. Each style contains microfiber technology that eases application and is soft to the touch. The industry leading high needle count manufacturing processes create an extremely durable fabric. So durable, VenActive offers a LIFETIME GUARANTEE! If VenActive isn't the best fitting and most durable you've owned, return them to us for another pair, free of charge. No strings attached. If you need a replacement pair, please fill out the warranty form and return your laundered garment following the instructions attached. LIFETIME GUARANTEE - We understand the importance of a long-lasting compression garment that fits perfectly. If at any time you find our product not to be the best fitting and most durable you've owned, return them to us for another pair, free of charge. ALL DAY COMFORT - Constructed with an ultra-wide top band for easy donning, VenActive Compression Socks are latex-free and feature non-irritating Y-gore seamless toe and heel pockets to fit the natural foot curve and prevent slipping. MICROFIBER MOISTURE MANAGEMENT - Designed to keep your feet cool and dry, these socks feature a mesh ventilation panel on the top of the foot and are constructed with microfiber technology to aid with moisture management and general breathability. If you have any questions about this product by VenActive, contact us by completing and submitting the form below. If you are looking for a specif part number, please include it with your message.